In the 1990s with the accelerated growth of the suburbs, First Presbyterian along with several other churches nearby, made the bold decision NOT to move to the burbs but rather invest capital in their current building and location. 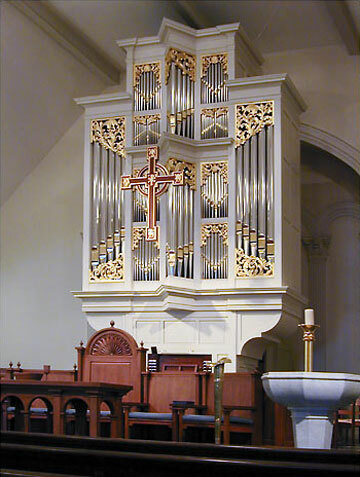 In conjunction with a complete renovation of the sanctuary by liturgical design consultant Terry Eason, a contract for a new organ was signed in 1995, with advisor Grigg Fountain, and then organist Gene Featherstone leading the drive. The organ was installed in 1998, voiced in 1999, and dedicated by Duke Chapel organist David Arcus. This is a tale of two organs: actually conceived as a sister instrument to opus 7 in Knoxville, TN, this organ illustrates how a basic physical design with nearly identical stoplists and scaling (save the Bordon16 instead of a Quintadena 16 in the great) can yield two different results. The two instruments were built concurrently but show how exterior decoration and meticulous voicing can respond to the environment. The warm, broad sound of this organ is ideal for American mid-size churches with average acoustics.